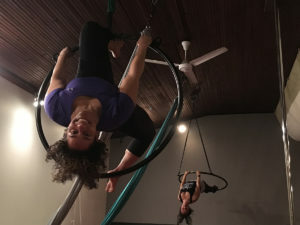 Some of the amazing benefits of aerial training is an increase in strength, flexibility and confidence. But training in a group environment has far more benefits than training at home alone. We’ve got 9 reasons why it’s better and more fun to train in class verses training alone. When training at home, you’ve got to be your own coach, which means it’s often easier to scroll through your Instagram feed than it is to practice those inverts. Attend a group class, and the motivation takes care of itself, as we encourage you to stay focused. Studies have shown a person works harder and achieves better results in a group environment than they do when working alone. This phenomenon is called the Köhler effect, and it all comes down to the fact no one wants to be the weakest link. You’re more likely to hit that spin or trick while you’re surrounded by other people verses trying it at home…alone. We are a boutique studio which means we require you to register in advance. If you no-show, you lose your class. That little hit to your wallet is great motivation to show up, even if your bed or Netflix is beckoning. Once class is over, you’ll be glad you went, because almost no one regrets coming to class! Guess what babe? 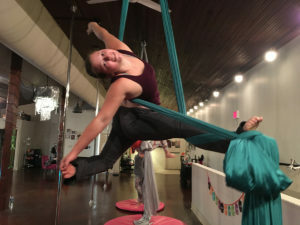 Pole and aerial can be dangerous. Safety is our number one goal! You’ve got a trained expert ready to spot you in that next amazing trick! Not to mention, our curriculum is structured, so you are learning new moves at an appropriate level. Plus we’re able to break down moves, correct form and give you exercises to do at home based off your needs (aka homework!). Now can Youtube do all of THAT for you? 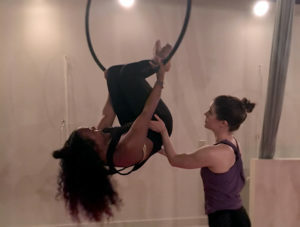 We offer a variety of grounded and aerial classes for brand-new beginners to advanced. Cross-training is highly recommended to keep your body healthy and safe from overuse injuries. 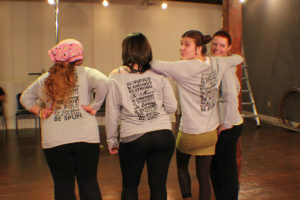 And all of our classes are geared towards creative movement and self-expression. Between the upbeat music and the we’re-all-in-this-together atmosphere, group classes can provide a surge of positive energy. Which means you might find yourself smiling even when the class itself is exhausting. Come to class and you’ve just entered a room full of other like-minded people week after week. Add in the rush of endorphins you get from working out, and you’ve got a real chance to make friends with those around you. Consistency is important if you expect to progress in your training. We offer multiple classes every day giving you lots of options to come to class. Having a consistent schedule, rather than a sporadic go-if-you-feel-like-it plan, can lead to lost progress.